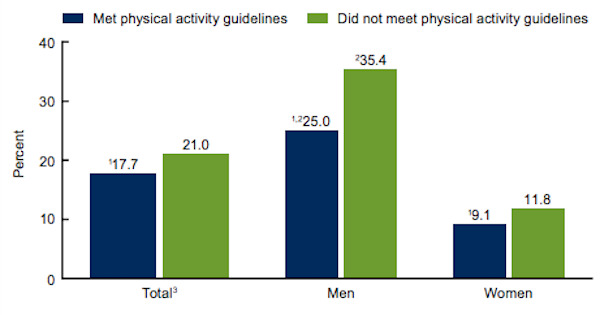 Notes: 1 Significantly different from subgroup that did not meet physical activity guidelines. 2 Significantly different from women in the same group. 3 Overall total of low HDL prevalence was 19.0%. HDL is high-density lipoprotein. Low HDL cholesterol is less than 40 mg/dL based on laboratory measurement. Data are age-adjusted by the direct method to the 2000 U.S. Census population, using age groups 20–39, 40–59, and 60 and over. Data Source: NCHS, National Health and Nutrition Examination Survey, 2011–2014. This entry was posted in Medicine and Society Data Watch on March 15, 2017 by Genevra Pittman.